No direct communication with your team but instructions for contact were very clear. The best stay ever! We will be using this property again and recommending it to friends! The jetted tub was fabulous after chilly beach time! And thank goodness there is onsite laundry!! The kitchen appliances were very high quality. Clean, quiet, nice view. 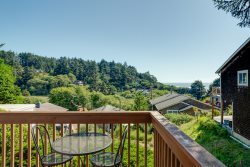 Wonderful stay ... very pleasant home in which to enjoy Manzanita! We had to request more toilet paper and propane during our stay. My husband called and talked to someone who was at our front door in less than 15 minutes. She was super friendly and personable. Everything got handled with a smile! Honestly, we loved that we all had our own bedrooms and there was lots of comfortable furniture. We've come to Manzanita every year since our children were young and now our two boys are each 6'-5" tall and sleeping on blow-up mattresses in a hotel room doesn't really work anymore. The house felt like staying at home and had all the little conveniences like beach towels and even body boards for fun down at the beach. We were all very comfortable and we were so happy to bring our little pug too. We loved sitting out at the fire feature at night after grilling our dinner. It really was one of the highlights of our stay this year. The weather was a little crazy but it was always comfortable to sit outside and just relax.